Tucked away in the dry scrub forests of northeastern Brazil, there’s an area of land larger than the island of Great Britain crammed full of ancient structures known locally as murundus. Standing 9 meters (roughly 30 feet) in diameter and 2.5 meters (over 8 feet) tall, the murundus are built out of more than 10 billion cubic meters (350 billion cubic feet) of earth – making them about 4,000 times larger in total than the Great Pyramid of Giza. But who gave birth to this colossal feat of engineering? Some forgotten Amazonian tribe, lost to the mists of time? A civilization like the Mayans, whose cities still languish in the Guatemalan rainforest? Aliens? For up to 4,000 years – about the same length of time as the pyramids have existed in Egypt – countless generations of termites have been building their mounds amongst the semi-arid vegetation. Hidden to outsiders until the last few decades, the 200-million-strong array has finally fallen victim to human development – and scientists have taken the opportunity to investigate the insect megastructures. 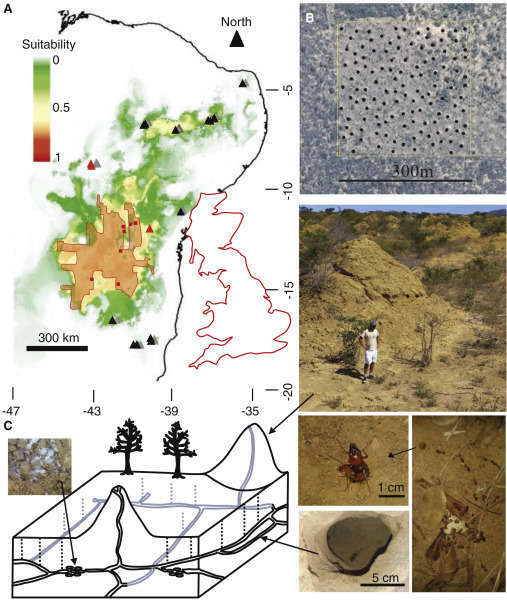 In their paper, published yesterday in Current Biology, the team of researchers describe how the vast collection of mounds – easily visible from space – were constructed. The reason for this epic engineering project is the termites' highly specific diet. They feed exclusively on leaves that fall from the caatinga vegetation that surrounds the murundus – so the tunnel network allows them to quickly forage on the forest floor while avoiding predators. Apart from being monumentally vast and ancient, the mounds have another remarkable feature: their “over-dispersed spatial pattern.” Like North American mima mounds, South African heuweltjies, or Namibian fairy circles, the murundus occur at strikingly regular distances from each other, which the researchers put down to inter-termite competition. There are still quite a few mysteries to solve, however. For instance, despite the huge number of mounds, no queen chamber has ever been found, making the physical structure of the colonies a complete unknown. Nevertheless, the murundus now have the honor of being the largest project in the world bioengineered by a single species. “It's incredible that, in this day and age, you can find an 'unknown' biological wonder of this sheer size and age still existing, with the occupants still present,” Martin said.